Arthur Ashe was a famous American professional tennis player. He won 3 Grand Slam titles; this raked him among the best tennis players from the U.S. He was also the first black player to be selected to the U.S. Davis Cup team and the only black person to ever win the singles title, the U.S. Open and Australian Open. He was ranked as the World No.1 by Harry Hopman, The Daily Telegraph and the World Tennis Magazine. Arthur was born on July 10th, 1943 in Virginia. He had one brother who was five years younger. In March 1945, his mother died from pregnancy related complications at the age of just 27. Arthur and his younger brother were raised by their dad who worked as a handyman and special policeman for Richmond’s recreation department. His father was a very strict disciplinarian who forbade Arthur to play football. During this time, football was a popular choice among the children. Arthur started to practice on a tennis court and learned a few strokes from Ron Charity, a younger player. 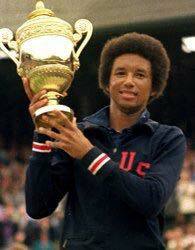 Arthur Ashe attended Maggie L. Walker High School. He continued to practice tennis and was even awarded a tennis scholarship to University of California in Los Angeles in 1963. At the university, he was a member of ROTC; this required him to join military service. In exchange, he got money for tuition. After a 1966 tournament, he joined the U.S. Army. He completed his basic training in Washington and he was later commissioned as second lieutenant. Arthur was assigned to U.S. Military Academy at West Point. Here, he worked as a data processor and also headed the academy’s tennis program. He left the army in 1969. Arthur was the first black player to be selected for the U.S. Davis Cup team in 1963. In 1968, he won the US Amateur Championships against Bob Lutz. He also won the first U.S. Open of open era and therefore became the first black man to capture this title. He is the only player to have won both of these amateurs plus the open championships in the same year. In 1970, Arthur won his 2nd Grand Slam singles title at Australian Open. In September the same year, he turned professional. In 1972, he supported the formation of Association of Tennis Professionals. In 1975, he won Wimbledon after defeating Jimmy Connors in the final. Arthur also won the season ending championship WCT Finals. Arthur Ashe continued to play for a few more years but this was slowed down by a heart surgery in 1979. He retired in 1980. After retiring, Arthur started to write for Time magazine and commentate for ABC Sports. He also helped in the founding process of National Junior Tennis League. He was elected to International Tennis Hall of Fame in 1985. He was also an active civil rights supporter and a member of 31 prominent African American people who visited South Africa to observe the political change in that country. Arthur married Jeanne in 1977 and, together, they adopted a daughter. In 1979, Arthur suffered a heart attack and in 1982, he publicly announced that he had contracted HIV from a blood transfusion. On February 6th, 1993, Arthur died at New York hospital at the age of 49.